The Bladebuilders Lightsaber is made by Hasbro, recommended for age 4+, and my boys wouldn't leave it alone while I was trying to take photos. It's one of the most exciting things any young Star Wars fan could ever review. The packaging is great, almost all recyclable card with thin plastic fastenings that pull out easily. 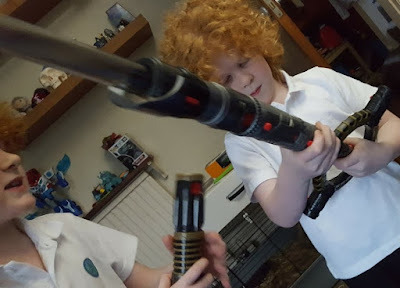 Christmas morning-friendly, the Bladebuilder arrives with 3 x AAA demo batteries in the Red Lightsaber, and you'll need 3 x AAA for the smaller White Lightdagger. There are only 5 parts, but it feels like more. 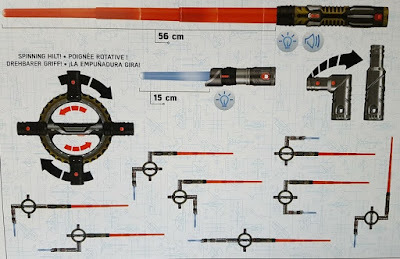 The large extending Red Lightsaber with light and real Lightsaber sound, the smaller White Lightdagger, the Rotating Hilt and two Elbow Connectors which twist to become straight. Everything can be attached together pretty much however you want. And actually it didn't take any time at all before they'd sussed how to join the different parts in whatever formation they fancied. 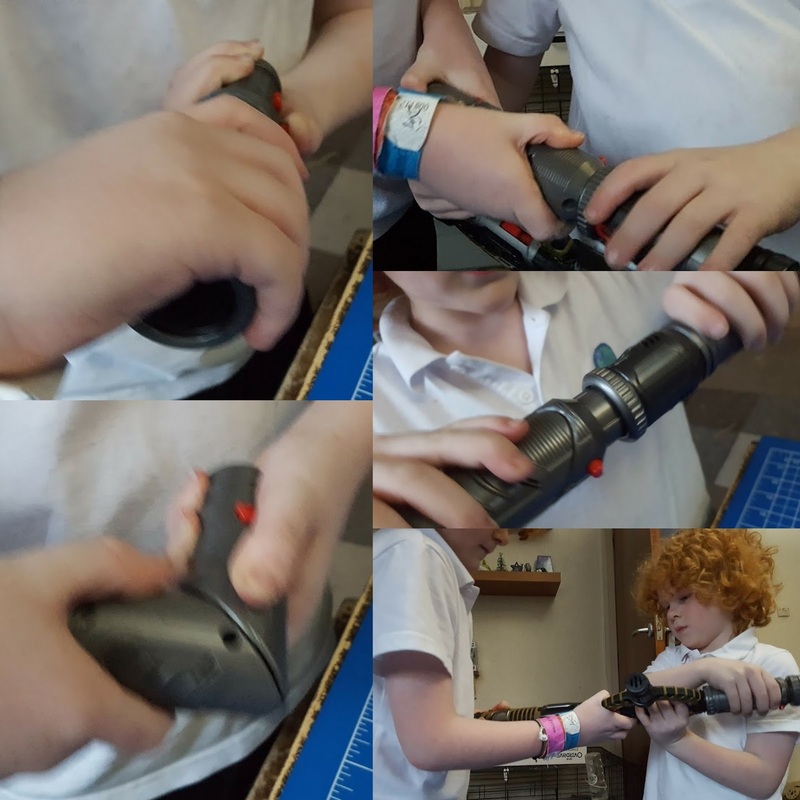 The Bladebuilder is completely intuitive, the buttons to release joints are in exactly the right places to be easy and handy, and twisting the elbow joints to straight joints and back is very smooth. 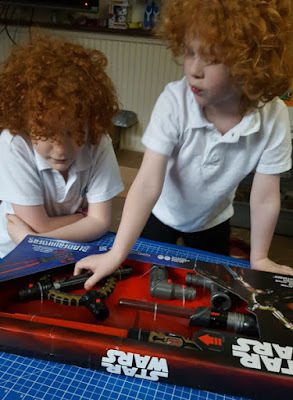 The box has example photographs of all the different ways the Spin-Action Lightsaber can go together, and my boys tried them all within 5 minutes. It's so easy to flip and change, even during battle. It's great. 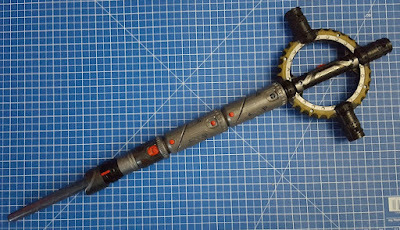 The Rotating Hilt takes a little more practise to master, mainly because we don't live in a giant cavernous Starcruiser, and your head gets in the way when you are spinning something nearly a metre long. But you can even practise by making a smaller version. 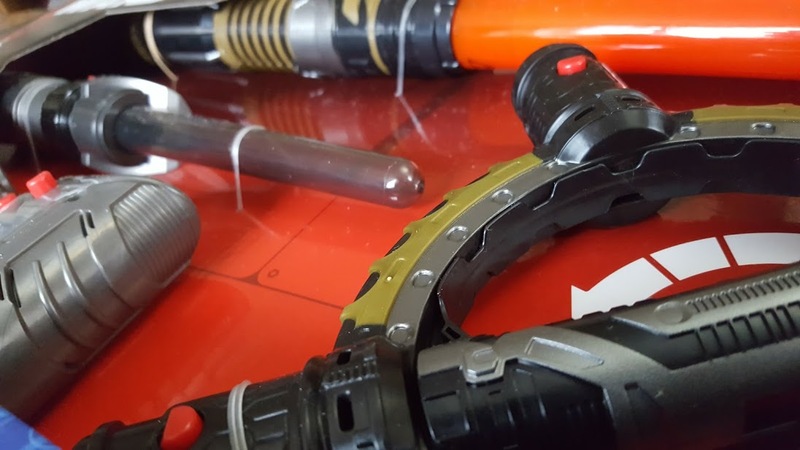 The Red Lightsaber is made from sections which collapse inside each other for storage. It's a very soft and slightly rubbery plastic which doesn't bend, but bounces a little and doesn't smart like regular plastic when it catches bare skin. The lights are great too. 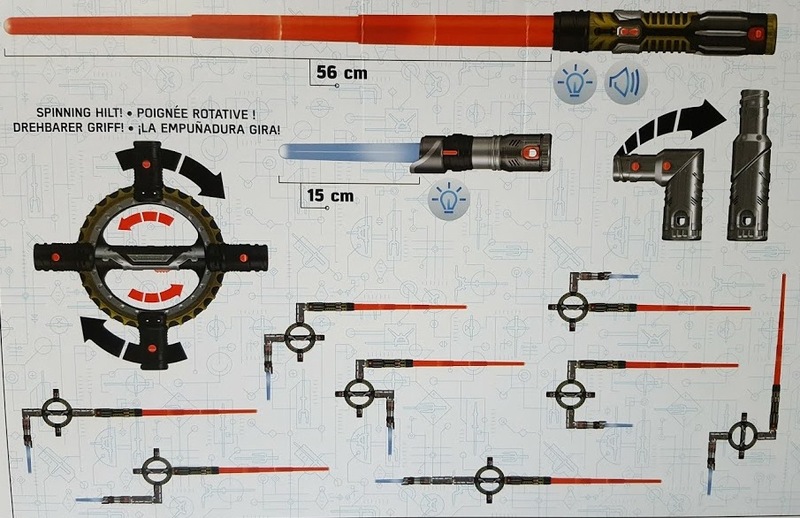 The sections and the way the Lightsabers are both put together is really clever, with a 'target effect'. 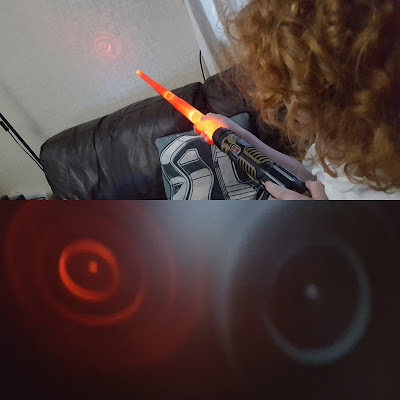 This actually makes my children less likely to want to actually hit each other, they're happy with the centre of the target over their victim. This has genuinely been played with the most of any toys we've reviewed in months. 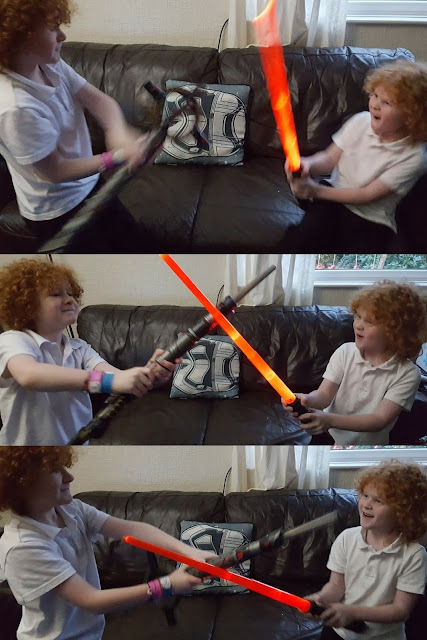 Both of my boys absolutely love it, and are happy to play alone, changing their design and making a new Lightsaber, but one of the best things about the Bladebuilders Spin-Action Lightsaber is that it will please two children at once!! Because you have two light up weapons and a collection of attachments, you can actually make two equally impressive weapons and children can play together. Genius. 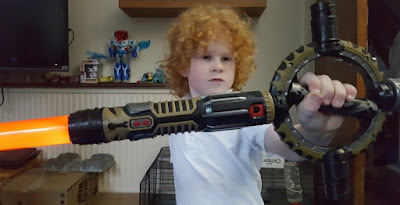 Clearly a hit here, and although we've had countless hundreds of battles, only a handful of minor injuries and I haven't had to confiscate it. It's been dropped down the stairs, accidentally smacked against every single object in my house, and it is good as new and we have no dints in the walls or woodwork. It's a win for me, and a win for them. A heck of a lot of thought has gone into design, and it shows. 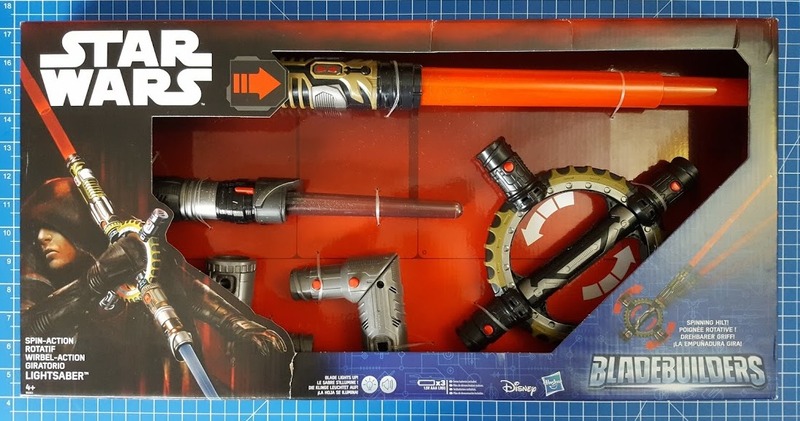 The Hasbro Star Wars Bladebuilders Spin-Action Lightsaber is suitable for age 4+, and has an rrp of £44.99. Before I reviewed I never thought I'd say it, but I can see why. If your child loves Star Wars and would like a Lightsaber, you'll really struggle to find one better for your money. From all good toy shops, including Smyths. 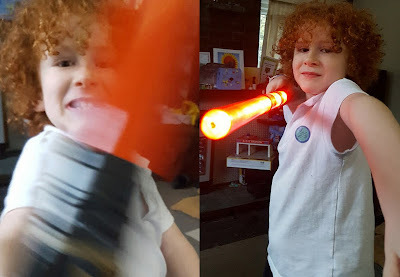 We were sent our Star Wars Bladebuilders Spin-Action Lightsaber from Hasbro for review.